A contemporary classical pianist, Lawson keeps the hours of a monk, both late and early—listening, waiting, and working. What Lawson creates in that time is as gentle and disarming as his demeanor. Known for his unique sound, achieved by placing felt between the piano’s hammers and strings, Lawson has been making his way around the world in a wide array of pairings. You’ve likely heard Lawson’s compositions in popular televisions shows such as The Walking Dead, or in commercials for IBM, Microsoft, and countless other media. Trained in improvisational jazz at Berklee College of Music, Lawson’s most notable partnership today is with Aaron Mahnke and his highly celebrated podcast turned Amazon Original show, Lore. Ranked by iTunes as the Best of 2015 and boasting five million monthly listeners, Lore is a captivating performance of terrifying tales of folklore and legends. The program is a dynamic production of history, curiosity, and the complexity of humankind. Mahnke’s distinct voice and depth of historical research are perfectly paired with Lawson’s gentle and often haunting score. Fans of Lore, podcast and show, know that it alway does. The standard caricature of the classical composer at work is one of wild inspiration and manic composition. Picture Tom Hulce as Mozart furiously writing through the night in Amadeus (1984). Lawson is different, quieter. For Lawson, a new collection of songs is not like waiting for lightning to strike. Or stars to align. Or phone to ring. No—it is more like feeling the wind begin to change and knowing it is about to rain. Lawson cites a church music leader for teaching him the value of patience and space. “Growing up in the church, the worship leader, Rick, who I got to play with, was not a schooled musician. He played very well but wasn’t theory-based. And it was funny, because I was classically trained, as was the bass player, and we both had a background in theory that we applied to our music. But what Rick had was such an eloquent sense of when to wait. That can’t be taught in any book, in any class. And there were elements when we would be in the midst of worship, and he would just wait and strum a few chords. It could be a minute; it could be ten minutes. And you just felt that in the room. Lawson’s music is tapping into something far more profound in the human spirit than what is typically assumed. This misunderstanding can be attributed to instrumental music being often regarded as background music. In his music, Lawson is addressing, directly and efficiently, something that is not background in the scene but central to the soul. 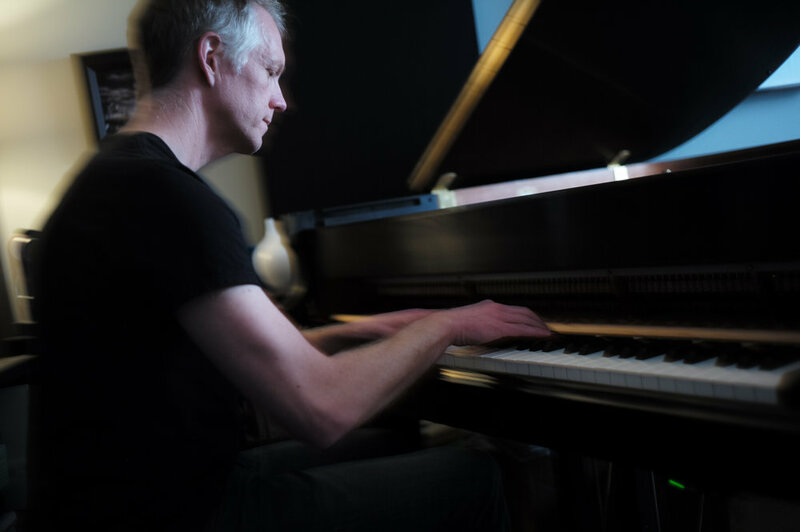 Although the listener might be unaware of the reason they are so drawn to his work, Lawson is able, through his own meditative approach, to offer something of a respite in the midst of chaotic work days. Every month, millions of listeners turn to Lawson’s piano while they read, enter data on spreadsheets, and meditate. He provides the soundtrack for both nervous first dates and heartbreaking hospital rooms. The invitation from Lawson is to go as intentionally contemplative as the listener desires. To be the vessel of restoration, you have to learn to listen and to wait. In a world that is often too busy to make space for stillness, reflection, or waiting, Chad Lawson offers up a melody of prayer from his piano, a song to pair with our frantic days. Just like the early morning monastic prayers (lauds), Lawson wakes before the world around him and composes songs for a world too busy to sit and wait for the wind to change and the rain to come.